A week ago today the monastic community of St Mary’s Abbey (Morristown, NJ), indeed the Church, lost a faithful monk, priest, abbot and friend. Abbot Thomas Confroy made his final passover to the Lord, his Destiny at the abbey on August 23. 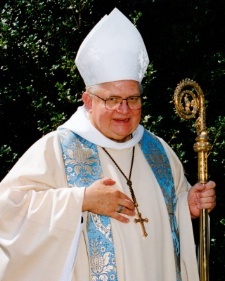 News of Abbot Thomas’ death can be read here. Saturdays: for himself, for forgiveness if any of his actions harmed others spiritually or emotionally. Plus, his quite example of suffering patiently and quietly from depression since his retirement and relying upon the Way of the Cross written by Saint Alphonse Liguori. What can we learn from Abbot Thomas? I believe his witness to Christ as a merciful good shepherd who cares intensely for the sheep, near and far, whole and broken, happy and miserable. Perhaps we ought to take his daily intentions?!?! Benedictine Oblate and friend Lynn Gordon Latchford wrote a fine panegyric to Abbot Thomas, “God Family Country: The Extraordinary Life of an Ordinary Monk, that can be read here: Abbot Thomas Confroy 2010.pdf. May Abbot Thomas rest in the arms of the Good Shepherd. Saint Joseph, husband of Mary, pray for us.